NFL, soccer, and other sport tributes for Paris (PHOTOS). Tributes to the victims of the Paris attack from around the world of sports. Throughout the world of sports, players and teams paid homage to the victims of Friday’s terrorist attacks in Paris over the weekend. From Denmark, to Sweden, to Great Britain, to the U.S., and China, here are images of a weekend of tributes to the French national colors of bleu, blanc, rouge. The following gallery has been republished from our sister site, Slate.fr. 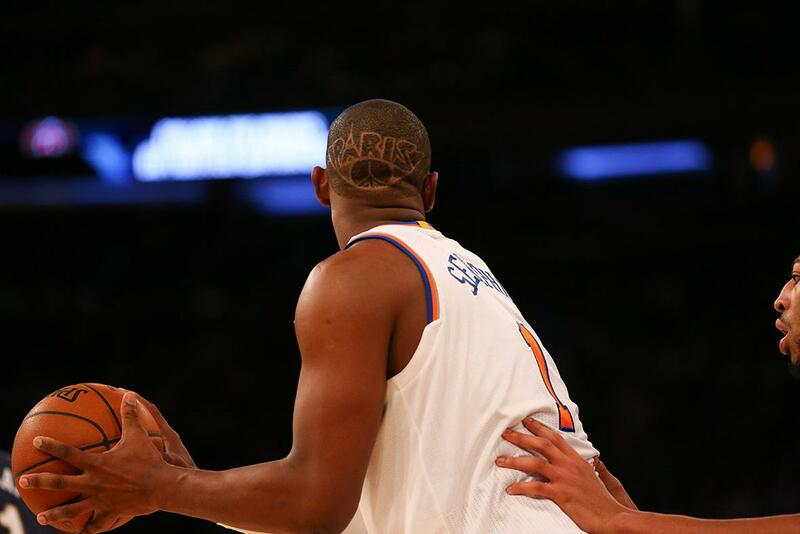 New York Knicks forward and Frenchman Kevin Seraphin shows his support for Paris during the Knicks game against the New Orleans Pelicans at Madison Square Garden on Nov. 15, 2015. 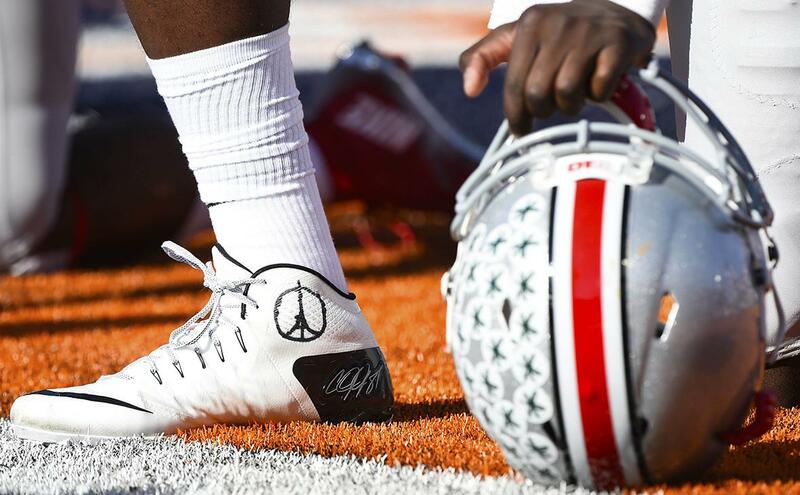 Ohio State Buckeyes quarterback Cardale Jones pays tribute to the victims of the attacks in Paris during the game against the Illinois Fighting Illini on Nov 14, 2015, in Champaign, Illinois. 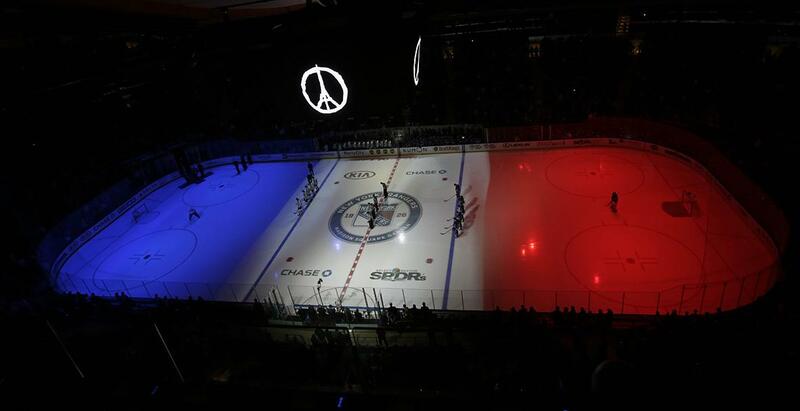 The Toronto Maple Leafs and the New York Rangers take a moment of silence for the victims of the terrorist acts in France on Nov. 15, 2015, in New York. 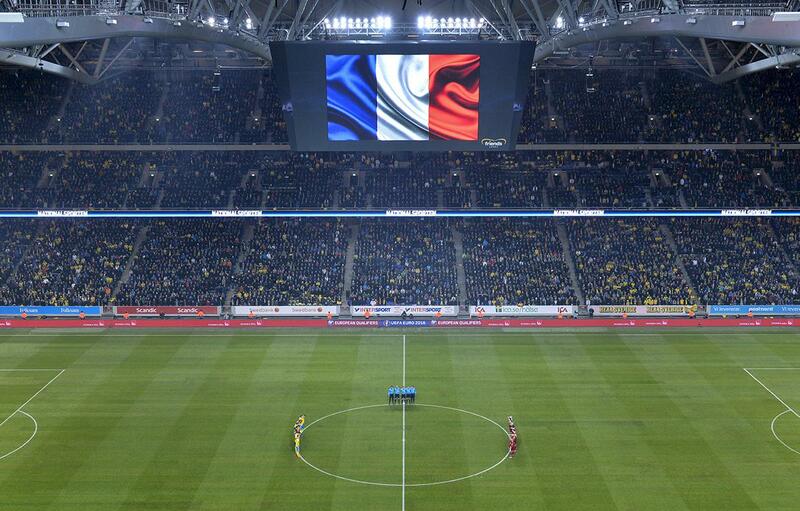 Sweden’s and Denmark’s national soccer teams observe a minute of silence to honor the victims in the terror attack in Paris on Nov. 14, 2015, in Stockholm. 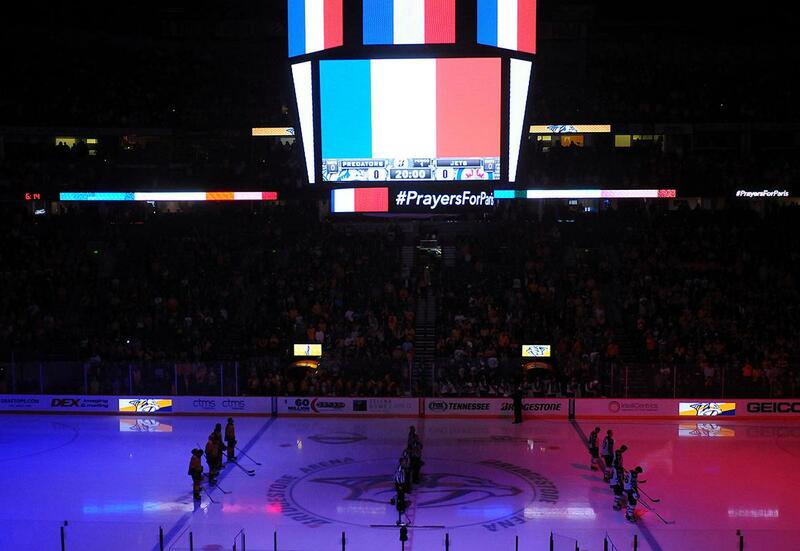 Nashville Predators and Winnipeg Jets players, along with fans, observe a moment of silence in tribute to the Paris victims on Nov. 14, 2015, in Nashville. 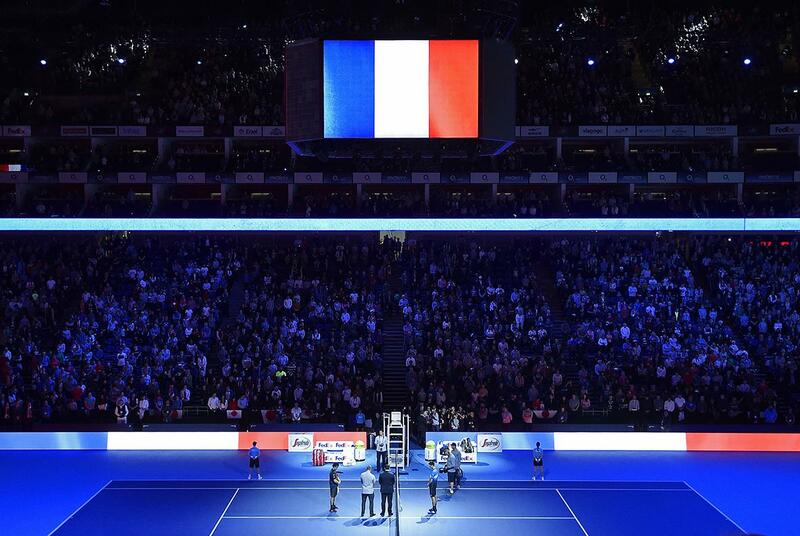 Japan’s Kei Nishikori, Serbia’s Novak Djokovic, spectators, and officials observe a minute silence for the Paris attack victims before a match in London on Nov. 15, 2015. 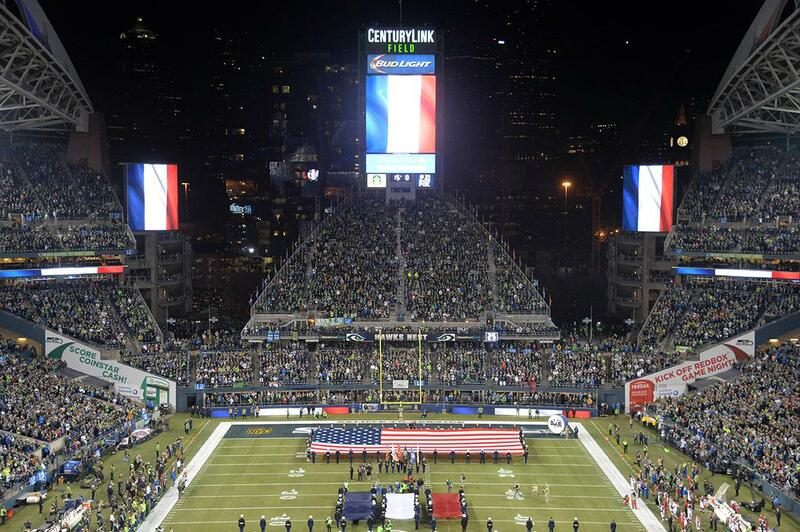 French and U.S. flags are displayed on the field during a moment of silence for Paris terrorist attack victims before a game between the Arizona Cardinals and the Seattle Seahawks on Nov. 15, 2015, in Seattle. 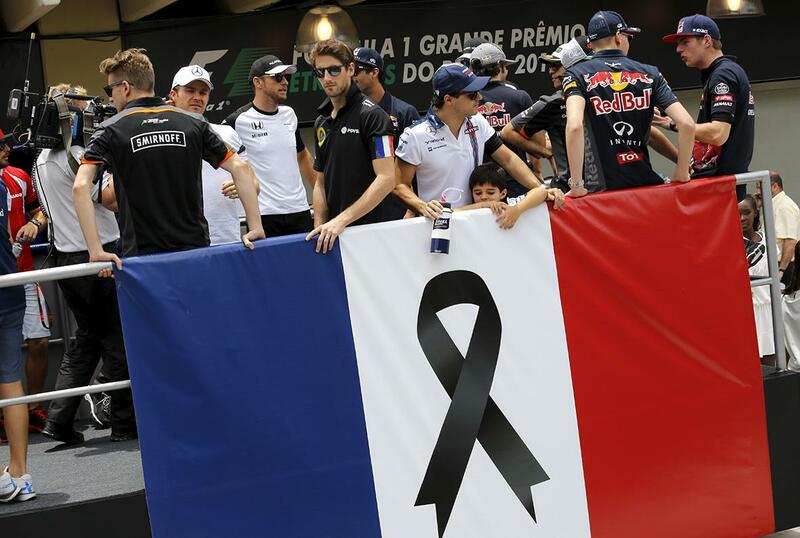 Formula One drivers participate in a parade in tribute to the victims of the Paris attacks before the Brazilian F1 Grand Prix in São Paulo on Nov. 15, 2015. 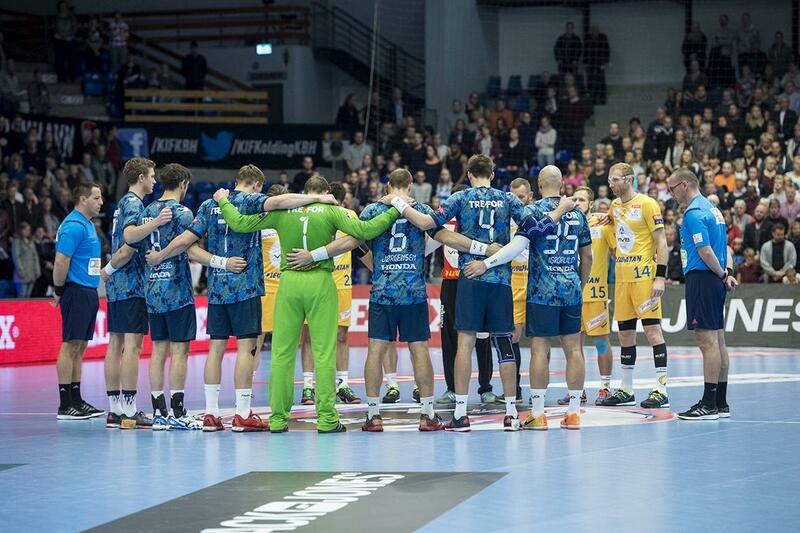 Players of Poland’s KS Vive Tauron Kielce and Denmark’s KIF Kolding Copenhagen observe a minute of silence for the victims of the Paris attacks at their men’s handball match in Denmark’s Trefor Arena Brondby on Nov. 15, 2015. 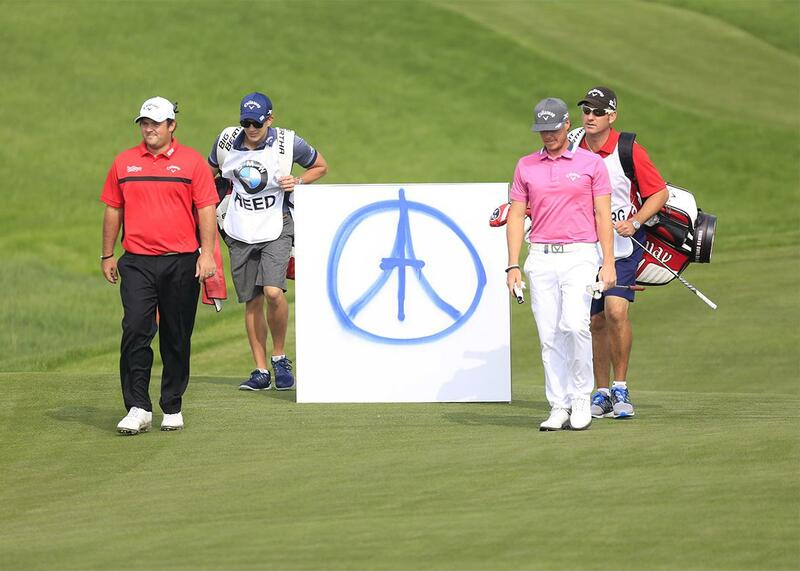 Patrick Reed, left, of the U.S. and Kristoffer Broberg, second right, of Sweden stand next to a peace symbol featuring the Eiffel Tower during the BMW Masters 2015 golf tournament in Shanghai on Nov. 15, 2015.